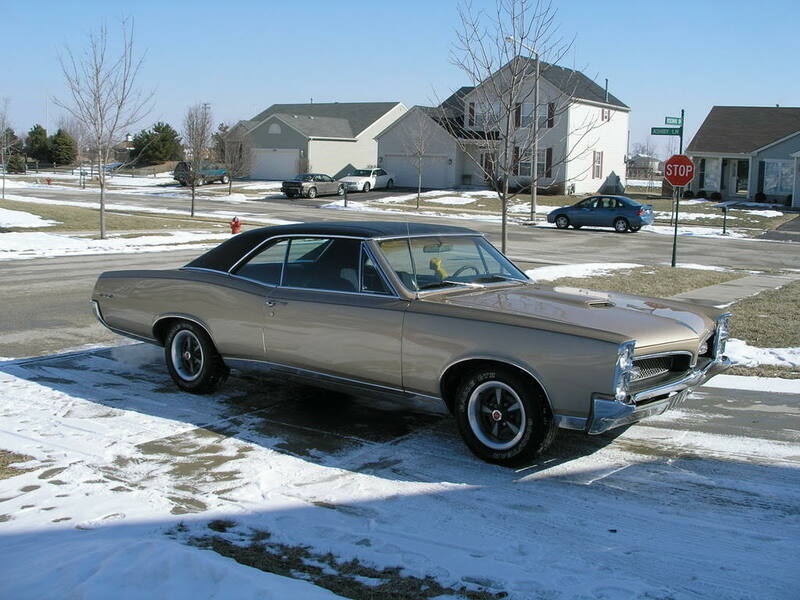 Qball created the topic: 1967 GTO: A saga for the ages. So, I had a decent write up about my GTO in the V8TV forums v1.0. Lost it when some filthy animal hacked in and wrecked it for everyone. So, this is an attempt to reconstruct what was lost. I've been a GTO guy since I was about 4 years old. The old man had a 66 GTO at the time. I remember riding in that car at break neck speeds, without seat belts, without a care in the world. But those memories are fleeting, at best. When I was 10, what really lit my fire was a picture in a photo album my paternal grand parents had. It was of my dad's 65 GTO. It was his first new car. He was still in the Army when he bought it. It was blue charcoal and I was in love the first time I saw it. I studied every line of that picture and I made a promise to myself that I, too, would have a GTO. Fast forward about 9 years. I'm 19 and in the Air Force, living the dream. I still have GTO fever. While looking at an issue of Auto Trader, I spot an ad for a 67 GTO. I look closer. The ad says it's straight, has a 455 and runs strong. I gotta see this car. In my head I already own it. The one big glitch is that it's 2 hours away and I don't have a set of wheels to get me there. I coerced a couple friends of mine to get me out there and to bring some tow straps, you know, just in case. So, we get there and I can barely contain my excitement. The guy who was selling it built the car to be a drag car. It had a big Carter Thermoquad carb with no choke so it was tough to keep running. The interior was really bad, though It was a diamond stitch vinyl seats and door panels. Really bad kustom stuff. I was in love. We made a deal on the car and just like that, I was a GTO owner! I proceded to attempt to drive it home. It kept stalling out and was making me crazy so out came the tow straps. Remember, we were 2 hours away and it was pretty dark at this point making our towing trip back to the base through back water Oklahoma pretty stressful and long. We made it without incident. The next day I went to work on the car trying to figure out why it kept stalling out. It didn't take long to realize what was happening. The previous owner was using an electric fuel pump and had it mounted high up on the inner fender. This was a pusher pump and simply couldn't pull all that fuel up to the carb causing it to starve. A quick relocation to the near the gas tank solved that issue. I still had a pretty aggressive, not too street friendly carb to deal with. To my delight, there was Rochester Quadrajet in the trunk. There was an automotive hobby shop on base so I took the carb there and gave it a rebuild. I swapped the Carter with the Rochester and, manna from heaven, that GTO turned into a monster! The ad was correct after the fact. That GTO was a mighty strong runner. But, you know, big power and 19 year old idiots typically don't mix and I was no exception. While doing some particularly spirited driving, my luck ran out and one of Oklahoma's finest took notice and decided to be a nice guy and show me the error of my ways. Reckless driving, no drivers license on me, no vehicle inspection sticker and no insurance were the 4 separate citations written that day. I was in big trouble. Luckily, a Lt Col friend of mine took pity on me and called the judge on my behalf and struck some sort of deal where I paid a decent fine and I was pretty much off scott free. But the writing was on the wall, this car had to go. I put it up for sale and got a pretty quick bite. This was in 1988-1989 and the muscle car market was very reasonable. A guy called me and asked if I was interested in a trade. I said I wasn't opposed to it and asked him what he had in mind. He had a 66 Sprint 6 Lemans. He brought it by and this car looked absolutely perfect. it was red with a black sprint stripe and Black interior. The sprint 6 was an overhead cam straight 6 that was used from 66 through 69. We'll get more into my old Sprint 6 in the next installment. 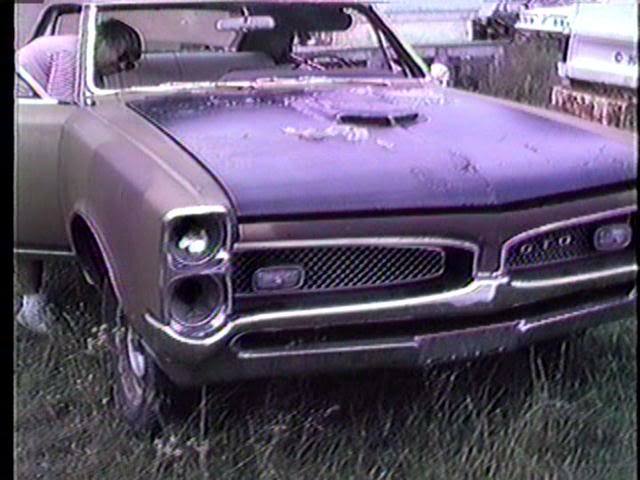 Very cool to see the GTO story from the beginning! Thanks for posting this, I see I'm not the only one who was bitten at an early age. Great story about the tow straps! I never had the luck of just a poorly mounted fuel-pump or a decent Q-jet in the trunk. That car sounded like a lot of fun... and trouble! I look forward to the next chapters. Okay, so when we left off, I was entertaining a trade offer for my GTO. The gentleman's name was Sam and he brought by his 66 Sprint 6 Lemans. Other than being a Sprint, it was pretty light in the option department. 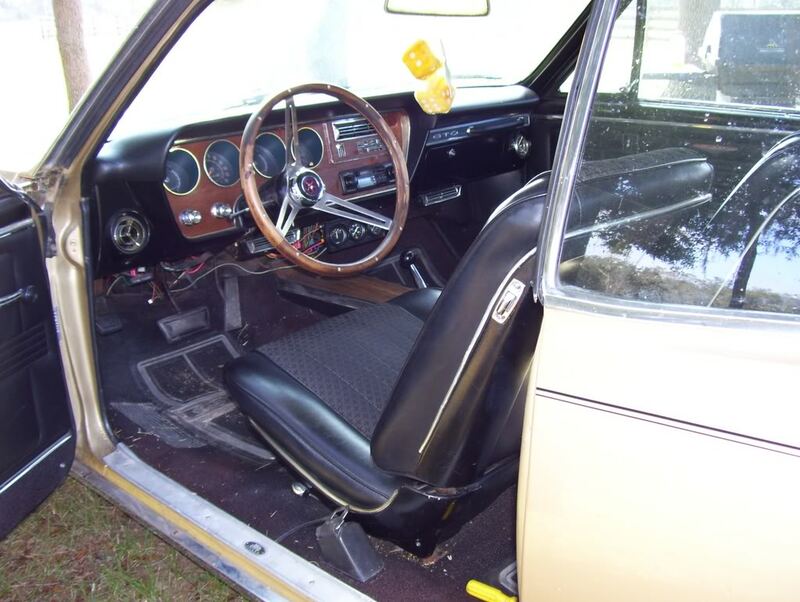 While it did have bucket seats and a center console, it was equipped with the Dearborn 3 speed manual floor shifted transmission, manual steering, manual brakes, non AC, and AM radio. The neat thing about the sprint option is that it was a high compression (10.75:1) engine that was sporting a Quadrajet carburetor. The displacement in 1966 was 231 cid and was rated at 200 hp. When Sam pulled up with this gem, I had a tough time keeping my poker face in check. This car was beautiful. the body was straight as an arrow, the paint was perfect and the interior was super clean without any tears. He suggested we trade cars plus some cash. Now, I wasn't sure which way he thinking the cash would go and didn't want to ask. But it came out that we would trade cars and he would give my $1,000 on top of that. The 20 year old me could not say yes fast enough (shrewd, Michael, very shrewd). 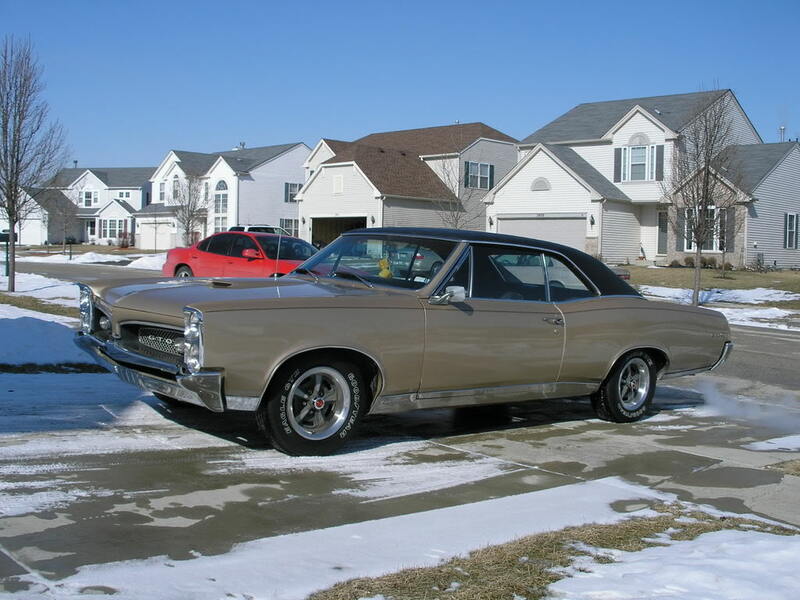 So, we traded titles, got the plates transferred and just like that, I was the proud owner of a 66 Sprint 6 Lemans. It didn't take me long to start tinkering with my new found love. It ran well enough so why not screw with it to make it run even better, right?? Now, at the time I wasn't really dialed into the effect lower octane gas had on high compression engines. The timing on the sprint was set a bit retarded and would make starting it a bit of an operation. I took it upon myself to tune this beast up right! I got the timing dead nuts on, tweaked the Quadrajet a bit, replaced spark plugs and I was off to the races. It started so much easier and seemed to pick up some power. The sprint engine actually sounded like a V8 at the tail pipe and really had a good bit of pep. aThe only exterior feature I changed was the wheel and tire combo. It had Buick rally wheels and while they didn't look bad, I wanted some true blue Pontiac rally II wheels on it. I tracked down a set and they needed to be restored so my buddy and I cleaned them up and painted them black. We found a couple of Goodyear Corvette VR-50 series tires at a gas station, picked them up and mounted them on the back. It looked so damn cool with the black rally IIs. At this point I'm pretty happy with what I got going on. I'm driving the car every day as it's my daily driver. Every so often, when transitioning from idle to part throttle, I hear a slight pinging coming from the engine. It doesn't seem so bad so I don't really pay it much attention. Remember when I said I wasn't really in tune with the relationship between high compression engine and their octane requirements? Yeah, I was about to get my lesson. While cruising down the expressway, with a loud boom and a lot of smoke, things came to an abrupt end . The sprint 6 suffered a catastrophic and spectacular failure. I was pretty bummed out, to say the least. I had the sprint towed to the base hobby shop and got to work. From outward appearances, everything looked fine. There was nothing that had breached the block or oil pan or the cast aluminum cam cover. Upon removal of the head, I was made aware of what was going on. Seems as though I was using too low of an octane gas and allowed my engine to detonate to death to the tune of number 6 piston literally being melted away. Hell of a way to learn a lesson. I complete the tear down of the engine and to add insult to injury, I see a hairline crack in number 6 cylinder. At first I was in denial. It's not that bad of a crack. It'll be fine. Nothing to see here! Well, I finally came to grips with the fact that I had to get some professional help. I took the block to a local machine shop. They were able to sleeve the cylinder and bored the others to get everything nice and consistent. I had to have the crank turned .010 under. They set me up with a set of pistons and rods, bearings, gaskets, and all the accoutrements needed to get back on the road. Getting things back together was pretty straight forward. Where things got complicated is when everything was all back together and running. The top end was very loud. Of course, I buried my head in the sand and ignored it and drove the car anyway. After about 400 miles pretty much every cam lobe was wiped out and the cam followers were scored and ruined. Not to be deterred, I sourced a new cam got a new set of followers and installed them and kept driving. What? fix the underlying issue? Why would I do that? That would show sound decision making on my part and we just can't have that!! After 3 go rounds with this, I decided enough was enough. I parked the car and there it sat. I was stationed ad Tinker Air Force Base in Oklahoma City. My dad lived in Dallas. The base was giving me grief for letting my car sit for so long and was telling me to move it or lose it. I called my dad and he agreed to come to the base and take the car back to his place. He had 4 acres so it would be out of the way. Problem solved for now. 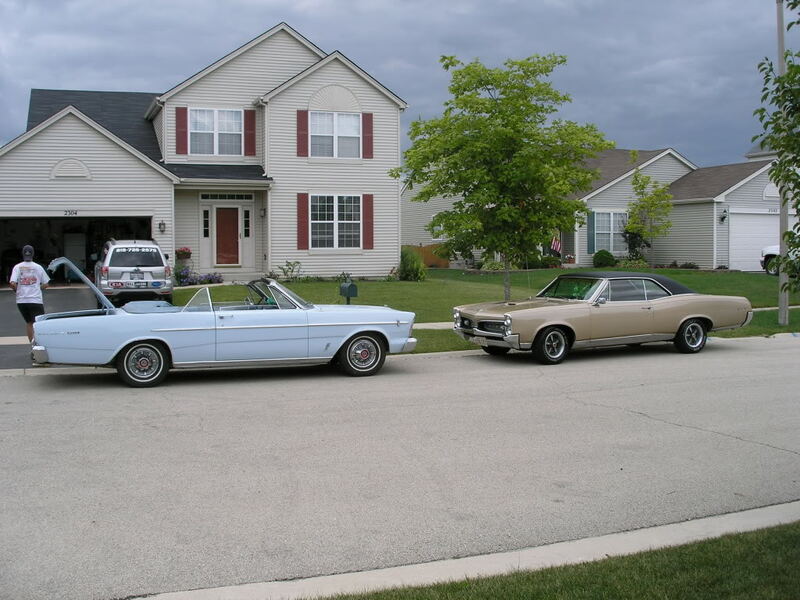 Some time went by and now dad was getting tired of having this heap taking up space at his place. So, the writing was on the wall. It was time to sell. It took forever to sell as the Sprint 6 Lemans market was pretty soft at the time. I think it went for about $700. It still hurts to this day thinking of the comedy of errors committed by me that led to this beauty's demise. I had no business owning this car. But some people learn the hard way. That was me. So that was the end of my time with a cool A body for quite some time. I had a pretty cool '77 Formula that I managed to not destroy. I had it for about 5 years. It was a fun car. It had Hurst T Tops, 400, auto, ac, ps pb and all that. I still missed having a cool GTO but that would have to wait. While I was in the Air Force, I was talking with my dad on the phone. He said that he had to get some work done on his car. He drove a truck but when he said 'car' I just thought he just being generic. He paused and said 'did you hear me? I said I had to get some work done on my car." I said, "yeah, I heard you. You're talking about your truck, right" 'No" he said, "I'm talking about my car I just got....A 1967 GTO!" I think I had an out of body experience. There was a GTO in my life again!! It wasn't mine but that was okay by me. The old man picked up a 1967 Signet Gold GTO. It had some good options like power steering, power brakes, auto trans and factory AC. It was a running driving car in decent shape. From the second he told me about it, I laid claim to it. 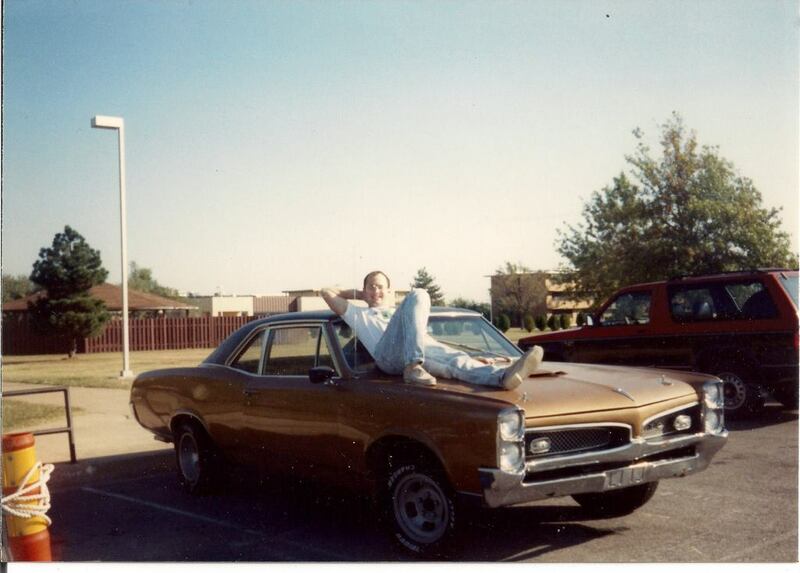 That's MY GTO, dad! One day, it would be. Last Edit: 02 Jul 2016 17:21 by Qball. 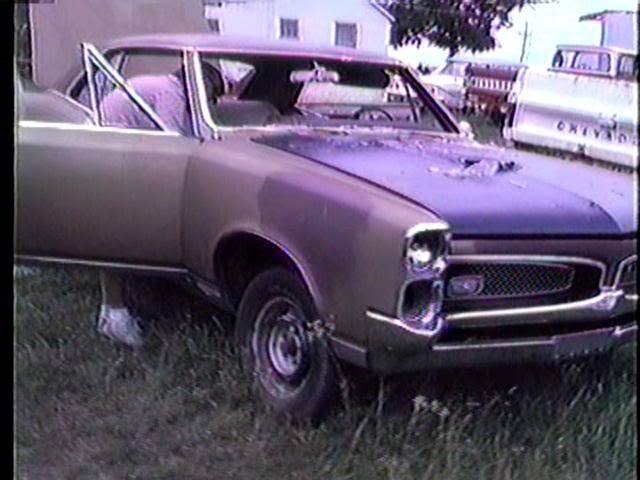 So this is your Dad's GTO from back in the day? And is that the Forumla in the background? This is a great story you're sharing here... so many things many of has lived through. The blind hope of youth and inexperience... just thinking that since you've spent some money and did some work, the problem HAS to be fixed, right? And learning the hard way that noises get louder and turn into bigger problems that always cost more the longer you ignore them. That old Sprint car sounds cool. What color was the car? Those OHC 6-cylinder engines are very cool, and you never see them anymore. That would make a cool hot rod engine, come to think of it. I had a similar "out of body experience" when my Dad said he was going to get another '62 Galaxie like the one he once had... but that's a different story. But the sheer disbelief that he was going to do it was wild! Last Edit: 03 Jul 2016 11:40 by oestek. That's the car shortly before pops took delivery of it. I was able to get in touch with the previous owner and he sent me a bunch of pics of it. It was in pretty sorry shape when he got it. this is one of the few pics I have of my old Formula and that's a 22 year old Qball. I know I have a pic of my 66 some where. It was red with a black sprint stripe, black interior. It was the prettiest car I've ever had. I would love to be able to have one again. Last Edit: 04 Jul 2016 00:27 by Qball. It became a running gag between my dad and me. Every time we would speak on the phone, I would ask him how my GTO is going. Typically he would scoff and say "yeah right", or "you wish". Needless to say, it was in pretty sorry shape. But, he worked some miracles and got it running, driving, and looking good. His wife drove it for about 5 years and then sold it to my dad. Bear in mind that this car was in Texas and Texas has a pretty hot sun and does a number on paint. The old goat was painted in laquer and when dad got a hold of it, the paint was pretty checked and brittle. so much so that dad was able to strip the paint by picking it off with his nails. Crazy, huh? He got to work on the car, ditching the mid 70's era 400 engine that was in it and pieced together a period correct 400. He found a correct YS block, it was a 68 vintage, proper 670 heads, and a 67 intake. He had the car painted a near correct Signet Gold. It's close but looks just a hair lighter. for the interior, he had fabric inserts put in the front and back seats to prevent your legs and the vinyl from becoming one with each other in the oppressive Texas then, later, Florida heat. To list all the things he did to this car would be a saga in and of itself. Suffice it to say, he had a folder about 2" thick of receipts. Over the years, I would visit and one non negotiable agenda item was GTO time. Dad and I would give it a good wash and wax, maybe tinker with something that needed tinkering and then take it for a spin. It was cheap therapy, that's for sure. Fast forward a few years to Nov 2007, I'm married and have 2 young girls we're raising, I'm living in the Chicago area, you know, making my way through life, doing the right thing, driving daily driver, commuter type cars. Out of no where I get an email from my Dad. 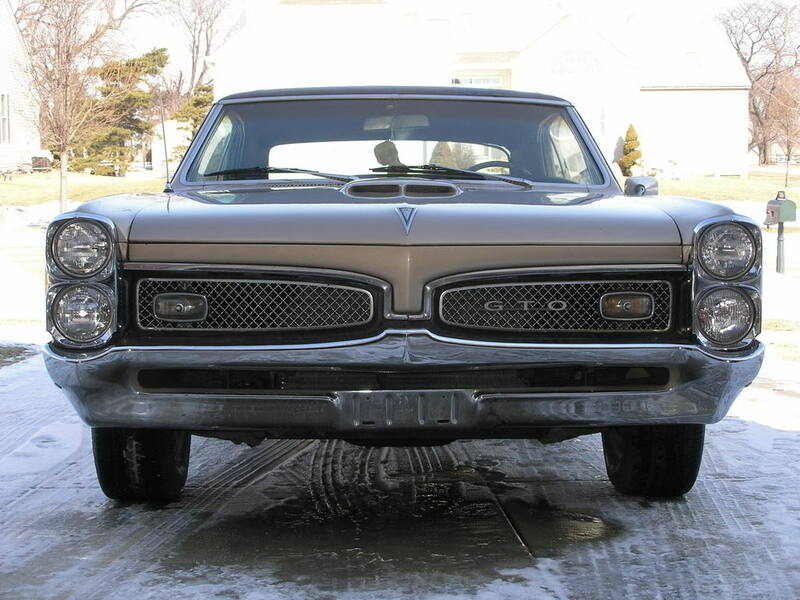 "The GTO is yours if you want it but you have to get it to your place on your dime"
I nearly fainted. I quickly verified that it wasn't April Fool's Day and he was playing a cruel joke on me. It was, indeed, November and this was no prank. I hastily called him up and he was for real. THE GTO WAS MINE!!! For a good hour I couldn't sit still. I was pacing back and forth with logistical scenarios playing out in my head on how I was going to get the old goat from the Tampa area, where dad my step mom had moved to a few years earlier, to the Chicago area. I researched a ton of carriers and heard just as many horror stories about damaged cars, cars that never showed up, cars that had tires with good tread when the car was loaded but somehow showed up with bald rear tires. I wasn't going to knee jerk this. I waited a few months before I felt comfortable enough to pull the trigger with a transport company I felt I could trust. So in Feb of 2008 I anxiously awaited arrival of my new baby. I was a pretty cold and snowy night around 11:00 PM when the driver called that he was at the drop off point just about 2 blocks from the house. I called my neighbor/friend, Robert, who was just as emotionally invested in this thing as I was, and we high tailed it to the transport truck. It was an open carrier and this guy went through every type of weather condition possible. The car was covered in a layer of brown road grime and salt spray. It looked pitiful. After a few unsuccessful attempts, the transport driver managed to get the old gal started. She's a bit cold blooded. He unloaded her, I gave the car as good of a look over as I could at that hour and with that much grime all over. I thanked the driver and Robert and I got in and drove the 2 blocks back to my place. I would have tried to go for a spin but I could barely see out of the windshield the roads were pretty snowy, I had no insurance and no valid plates. The 20 year old me would have never let that stop him. I must be *gasp* maturing. The next day I let my Dad know that she arrived safe and sound. He was relieved. Most people who know me, know that I'm not a patient man. It was TORTURE waiting for the snow to melt and the day to be nice enough to get behind the wheel of my new mistress. That day came a few weeks later and the first order of business was to get this heap washed. I went to one of those drive through car washes where they dry your car off for you and clean the interior after the wash. It was almost comical watching people stare all slack jawed at me and my new beauty. What's the matter? Ain't you never seen a car this bitchin', before?? The link is a walk around video I did, as well. I promptly joined my local GTO club, The Cruisin' Tigers GTO club. I wanted to start building a network of people who knew what they were talking about. Plus, I'd get to see more GTOs! For about the first year or two, I drove it like I stole it and was having a blast. So when the Hot Rod Power Tour came around, I was a lock. Unfortunately (or fortunately) I wouldn't be able to long haul it, I only had time enough for one leg and that was at the Iowa Speedway in Newton Iowa. It's about a 270 mile one way trip and would be the longest trip I'd made with the car. my friend, Robert gets the credit for getting me to go. He was bringing his '66 Galaxie convertible. 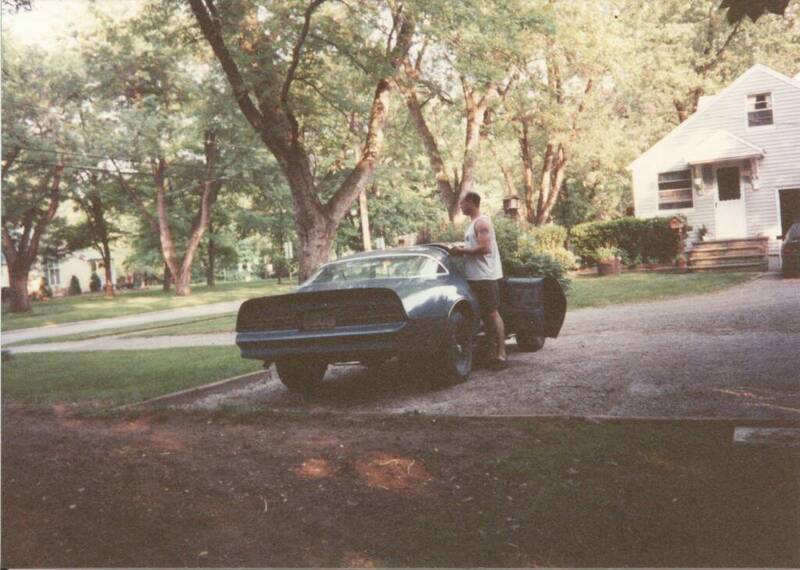 He had gotten his Galaxie about 2 years before I got the GTO. Both cars were untested at these distances. What could go wrong? The drive out there was (from a mechanical break down point of view) uneventful. We got there, registered, hung out, saw some cool rides, I even took a few laps on the track which was one hell of a blast. We stayed for a few hours and then it was time to head home. We got about 1 hour away from home in the town of Princeton, IL when my exhaust became abruptly much louder, almost as if I had no exhaust system, at all. It was deafening. We were at a stop light when it happened. We pulled off the road and into a McDonalds parking lot to see what had happened. It was the pretty weird. The joint where the down pipe mates with the exhaust manifold was so rotted away that the down pipe simply fell out of the exhaust manifold. There was nothing for the clamp to hold together. Luckily, we were next to a Walmart. I was able to secure some bailing wire to make a temporary repair so I wouldn't suffer permanent hearing loss during the remainder of out drive. I jacked the car up at the McDonalds parking lot and started to get to work. I failed to mention that there was some severe weather moving in our direction. The sky was turning green and the clouds were looking very irregular. I pressed on with the repair but Robert was having none of it. He was voicing his concerns non stop so I finally relented and we went inside the McDonalds to wait it out. about 2 minutes later, a couple burst in to the McDonalds and said "Holy cow, a tornado just passed us up on the expressway!!!!" Robert turned and looked at me with that I TOLD YOU!!!!! look on his face. Okay, buddy, you saved my bacon. I owe ya one. We waited until the really heavy stuff passed us by and decided to press on. I finished the temp repair on the exhaust pipe. It wouldn't win any awards but it cut the noise down to a manageable level. As we pull out, Robert discovers that his windshield wipers decided to go on strike. They were working before we stopped but just quit. We checked the fuse and it was okay. It's getting dark at this point and we have no choice but to press on. I become lead vehicle and Robert has to follow right on my tail so he can see my tail lights. We did this fir the hour drive home. It was exhausting (no pun intended) but we were home safe. That was my first major thing to go wrong. That's when I got my lesson that owning a classic car can be pretty expensive! Of course, the entire exhaust needed to be replaced. I used the opportunity to upgrade a bit. I ended up going with a PYPES 2.5" full stainless exhaust with X pipe and the Race Pro mufflers and the trumpet exhaust tips. It's a great system with a cool sound without being obnoxious. 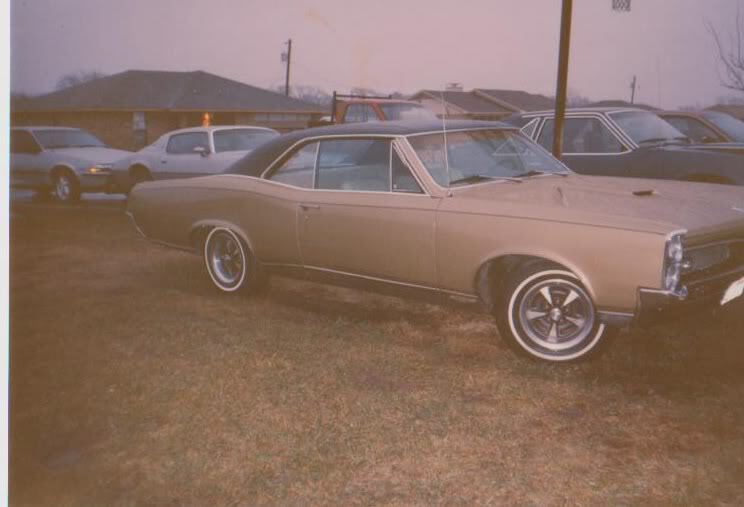 One of the things that had been going on with the GTO when my dad owned it was when you hit the brakes, the front end of the car would shift to the left. The wheel wouldn't try to jerk out of your hand or anything like that. Just the whole front end would move. It was pretty obvious that the front suspension was shot. Knowing that I had some work ahead of me and knowing that I wanted to improve the handling of this car, I decided to replace much of the front suspension. I went with tubular upper and lower control arms, front disc brakes, new front and rear springs, 1.25" front sway bar and KYB gas adjust shocks all around. It made for an unbelievable improvement in road manners. It felt so stable at any speed up to 100+ MPH. The brakes are still giving me issues. It feels as though there's no power boost and you cannot under any circumstances lock the brakes. It makes a gradual stop. Not very confidence inspiring, I know. But I'm confident I'll get it sorted out.